This book highlights the most recent advances in nano science from leading researchers in Ukraine, Europe and beyond. It features contributions from participants of the 3rd International Summer School "Nanotechnology: From Fundamental Research to Innovations," held in Yaremche, Ukraine on August 23-26, 2014 and of the 2nd International NANO-2014 Conference, held in Lviv, Ukraine on August 27-30, 2014. These events took place within the framework of the European Commission FP7 project Nano twinning and were organized jointly by the Institute of Physics of the National Academy of Sciences of Ukraine, University of Tartu (Estonia), University of Turin (Italy) and Pierre and Marie Curie University (France). Internationally recognized experts from a wide range of universities and research institutions share their knowledge and key results in the areas of nanocomposites and nanomaterials, nanostructured surfaces, microscopy of nano-objects, nano-optics and nano photonics, nano plasmonics, nano chemistry, nano biotechnology and surface enhanced spectroscopy. Illustrations note 33 Tables, black and white; 117 Illustrations, color; 136 Illustrations, black and white; XIX, 489 p. 253 illus., 117 illus. in color. This book highlights the most recent advances in nanoscience from leading researchers in Ukraine, Europe, and beyond. 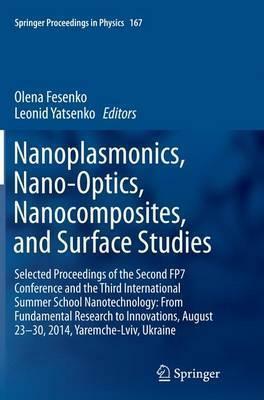 It features contributions from participants of the 3rd International Summer School "Nanotechnology: From Fundamental Research to Innovations," held in Yaremche, Ukraine on August 23-26, 2014 and of the 2nd International NANO-2014 Conference, held in Lviv, Ukraine on August 27-30, 2014. These events took place within the framework of the European Commission FP7 project Nanotwinning, and were organized jointly by the Institute of Physics of the National Academy of Sciences of Ukraine, University of Tartu (Estonia), University of Turin (Italy), and Pierre and Marie Curie University (France). Internationally recognized experts from a wide range of universities and research institutions share their knowledge and key results in the areas of nanocomposites and nanomaterials, nanostructured surfaces, microscopy of nano-objects, nano-optics and nanophotonics, nanoplasmonics, nanochemistry, nanobiotechnology, and surface enhanced spectroscopy. Part I: Nano composites and Nano structures.- Deposition and Characterization of Nanocomposition Cr3C2-TaC-NiCr Coating by Multi-Chamber Detonation Sprayer.- Biomimetic Composites Reinforced by Branched Nanofibers.- Kinetics of Dispersion-coagulation during Annealing of Metal Nanofilms Deposited onto the Surface of Non-metallic Materials.- Magnetization in Nanostructures with Strong-Spin-Orbit Interaction.- Molecular Dynamics of Thin Mesogene Layer Covering Carbon Nanotube.- Computer Simulation of Cholesterol Molecules Embedded in High-Density Lipoprotein.- Design and Characterization of in situ Synthesized Hybrid Polymeric Materials.- The Properties of Water Nanostructures in Nanosystems.- 3-D Artificial Nanodiamonds Containing Nanocomposites Based on Hybrid Polyurethane-poly(2-hydroxyethyl methacrylate) Polymer Matrix.- Spin-crossover Nanocrystals and Ising Model.- Formulation and Rheology of Tape Casting Suspensions Based on BaTiO3 Nanopowders-. Nanodimension Layers on Stainless Steel Surface Synthesized by Ionic Implantation and Their Simulation.- Transport Properties of the Dirac-Weyl Electrons through the Graphene-based Superlattice Modulated by the Fermi Velocity Barriers.- Study of the Dynamics of Formation of Spatial Nanostructures.- Colloid-chemical and Nanochemical Processes in Peloids on Basis of Ferrous Clay Minerals.- Magnetic and Neutron Diffraction Studies of Magnetic Properties of the Nanoparticle RMnO3 (R = Tb, Dy) Manganites.- Temperature Dependence of the Band Gap of CdTe/CdS Core-shell Quantum Dots.- Dynamical Properties of Two-dimensional Aggregates in Patchy Particle Systems.- Part II: Nanophotonics.- Synthesis and Characterization of Titanium (IV) Oxide from Various Precursors.- Silicon Submicron Rods Imaging by Surface Plasmon Resonance.- Synthesis of Photoactive Styrylquinoline Containing Polymers.- The Effects of Disorder on the Optical Spectra of Synthetic Opals.- Correlation Processing of Speckle Pattern in Multimode Polymer Optical Fiber for Deformation Monitoring in Nanometer Range.- Biosynthesis of Quantum Dots and Their Potential Applications in Biology and Biomedicine.- Part III: Nanobiotechnology.- Computer Simulation Study of the Molecular Dynamics in Homocysteine Systems.- Nanocomposites in Technology of Cryopreservation of Sperm Boars.- Plasmonic Nanochips for Application in Surface Enhanced Fluorescence Spectroscopy: Factor of Dielectric Substrate.- Influence of Gold Nanoparticles on Human Fibroblast before and after Cryopreservation.- Part IV: Applications.- Anodic Alumina-based Nanoporous Coatings for Sensory Applications.- New Nanosized Systems of Polymer Metal Complexes based ss-diketones and Lanthanides for Electroluminescent Devices.- Nanomaterials for Ink-jet Printed Electronics.- Influence of Hydrogen on the Mechanical Properties of Steels with the Surface Nanostructures.- Optimization of Graphene Oxide Synthesis and its Reduction.